Bush tick Haemaphysalis longicornis, copyright Commonsource. 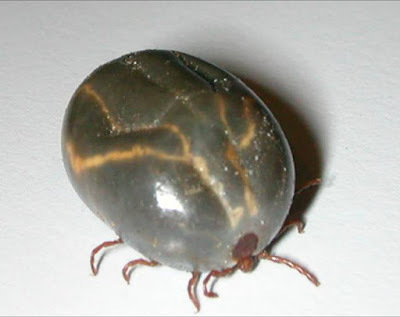 Haemaphysalis is a genus of ticks feeding on birds and mammals primarily found in the Old World (Keirans 2009). Characters (from Keirans 2009): Ornate; eyes absent; palpi short, with segment II as broad as long and usually much broader than long, obviously extended laterally, basis capituli dorsally rectangular. [A56] Anastos, G. 1956. The ticks (Acarina: Ixodoidea) of the J. Klapperich Afghanistan Expedition, 1952 and 1953. Journal of the Washington Academy of Sciences 46 (1): 18–19. [F91] Filippova, N. A. 1991. A hypothesis for the palaeogenesis of the distribution of the main vectors for Lyme disease. In: Dusbábek, F., & V. Bukva (eds) Modern Acarology: Proceedings of the VIII International Congress of Acarology, held in České Budĕjovice, Czechoslovakia, 6–11 August 1990 vol. 1 pp. 109–118. SPB Academic Publishing: The Hague. [FKK91] Fujisaki, K., T. Kamio & S. Kawazu. 1991. Theileria sergenti cannot be regarded as the same species as T. buffeli and T. orientalis because of its transmissibility only by Kaiseriana ticks. In: Dusbábek, F., & V. Bukva (eds) Modern Acarology: Proceedings of the VIII International Congress of Acarology, held in České Budĕjovice, Czechoslovakia, 6–11 August 1990 vol. 1 pp. 233–237. SPB Academic Publishing: The Hague. [VR91] Výrosteková, V., J. Řeháček, D. Guryčová & E. Kocianová. 1991. Prevalence of Francisella tularensis in ticks of Slovakia. In: Dusbábek, F., & V. Bukva (eds) Modern Acarology: Proceedings of the VIII International Congress of Acarology, held in České Budĕjovice, Czechoslovakia, 6–11 August 1990 vol. 2 pp. 55–59. SPB Academic Publishing: The Hague.